Grown used to an aching pain on the side of your hip? Just accepted that the soreness is there to stay? It’s likely pain in the tensor fascia latae (TFL) – a common complaint that can be alleviated with the 3 steps outlined in this guide. While conventional treatments like static stretching, massage and trigger point release therapy are useful in the acute stages, they won’t provide lasting relief from tensor fasciae latae pain. Read on to discover the root causes of chronic TFL pain and tightness and the 3 steps to eliminate it for good. What is the Tensor Fasciae Latae? The name tensor fasciae latae may sound like it’s from a different language and, well, that’s because it is. It’s from latin and translates to “stretcher of the wide band” . 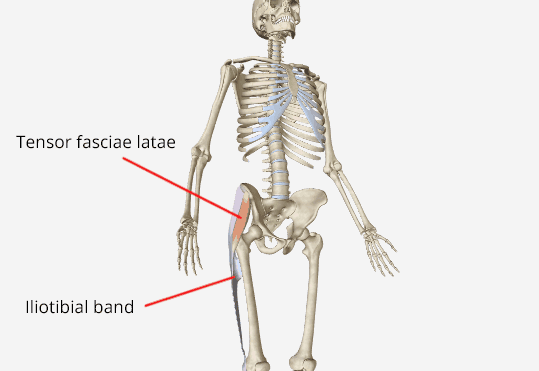 Tensor means stretcher and the wide band in this case is the fasciae lata, which is the fascia that surrounds all of the thigh muscles. 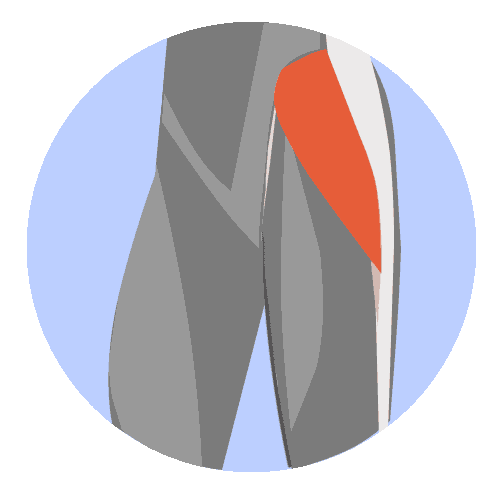 This fasciae is thicker on the lateral side, which is known as the iliotibial band (ITB). The TFL then inserts into the ilitiobial band just before the halfway point of the thigh, which runs down the lateral aspect of your thigh and inserts into the lateral condyle of the tibia. It’s a superficial muscle and thus can be found very easily by first locating the top of your pelvis on the side of your body with your thumb, then moving slightly anterior and down. What does the Tensor Fasciae Latae muscle do? The TFL is a 2-joint muscle because the TFL originates on the pelvis and inserts into the tibia, which means it effects both the hip and knee joints. At the hip, the TFL contributes to 3 movements: flexion (bringing the thight toward the chest), abduction (taking the thigh away from the midline) and internal rotation (rotating the thigh so the knee points inwards). 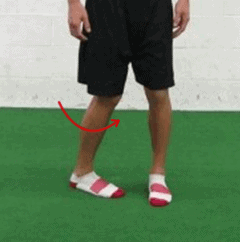 At the knee when it is flexed, the TFL contributes to external tibial rotation i.e. turning the toe outwards. These are the simple biomechanical actions of the tensor fasciae latae, however it also contributes to more complex movement and/or activation patterns. 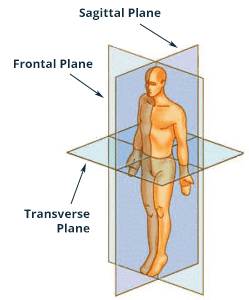 There are 3 planes of motion through which we move: frontal, sagittal and transverse and these muscles work together to maintain alignment of the body in the frontal plane when on one leg, such as when walking, running, hiking through the mountains or simply standing there working on your balance. When the TFL isn’t functioning correctly and you’re standing on one leg, your pelvis might drop on the side opposite to the dysfunctional muscle (known as the Trendelenburg sign), your pelvis might shift laterally towards the stance leg, or the knee on the leg you’re standing on might cave in or rotate inwards. In fact, standing on one leg is a simple test you can do to assess the strength/function of the TFL and if you exhibit any of the problems above, in addition to painful your TFL may also be dysfunctional and/or weak. 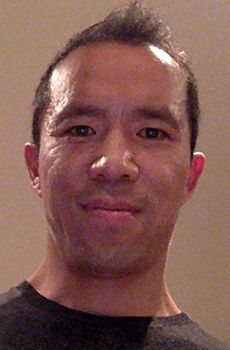 When I was studying Kinesiology at the University of Waterloo, one of my co-op work placements was at a physio/chiro clinic where Active Release Techniques (ART) were heavily used. This was back in 2000 so ART was an emerging form of manual therapy at the time and I saw many patients get great results from it. One weekend I met up with my buddy Matt, who was a nationally ranked mountain biker. He was complaining that he’d been suffering from IT band pain for a few weeks. At the clinic, I’d recently seen the chiro do some ART on the IT band of a figure skater, so I did the same thing to my friend. After just one treatment, his IT band pain was gone and it never came back. I was young, inexperienced and didn’t understand the root causes of pain so for a while after that I believed ART and deep trigger point style therapy was the cure-all for chronic musculoskeletal pain. I was quickly taught this wasn’t the case after hammering away at people who complained of pain and finding my treatments didn’t provide lasting results. Pain in a muscle is often the result of that muscle becoming facilitated - which means it works more than it should. Muscles become facilitated because synergists of that muscle (muscles that perform the same function) are dysfunctional due to weakness or inhibition. I refer to this phenomenon as pain as a result of a Compensatory Movement and/or Activation Pattern (M/AP) due to Functional Overlap. The TFL is compensating for muscles that serve the same function but aren’t doing their job. When this is the root cause, static stretching, massage and trigger point therapy on the TFL will never provide lasting relief. 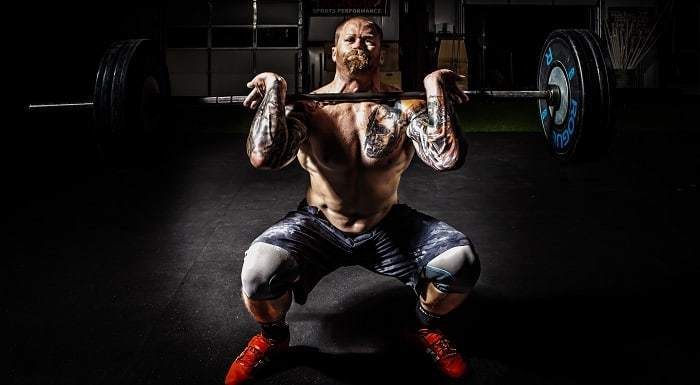 To effectively address the problem requires fixing the synergistic muscles that aren’t working properly, which requires proper understanding of anatomy and biomechanics. The iliiopsoas is the primary hip flexor, so if it’s not working, other muscles have to work overtime to pick up the slack because we need to flex our hips for basic everyday movements like walking and going up stairs. So the TFL says, “I can help out!” and soon, it’s doing the job of the iliopsoas, but because it’s a relatively small muscle that averages just 2.1mm deep and 18cm long, it quickly gets overworked. The pain due to facilitation and overuse of your TFL is exactly what happens to your muscles after a hard workout, which is known as delayed onset muscle soreness (DOMS). DOMS is that sensation of stiff and sore muscles you feel a day or two after an intense session at the gym due to damage to the muscular fibers from the workout. Only in the case of tensor fasciae latae pain, it’s not a good workout that’s causing the pain - it’s chronic overuse. This isn’t cool because, unlike your workouts which are targeted and purposeful, this is just an ongoing, unintentional ache. And unlike workouts, which you (hopefully) are spacing out to give yourself time to recover, your TFL isn’t getting this kind treatment. Now that you understand the many possible root causes of TFL pain, it’s clear to see that an effective approach requires restoring proper function to the dysfunctional synergists and not just poking and prodding at the poor tensor fasciae latae. When there's pain in the tensor fasciae latae, it doesn't function optimally. And when the TFL doesn't function optimally, other problems occur. Before we get into the steps to effectively address the root causes of tensor fasciae latae pain, here are some of these other problems commonly found in people suffering from TFL pain. While we have a “which came first, the chicken or the egg” situation, excessive activity and pain in the TFL is a signal that something is wrong and that biomechanics are altered. Whenever biomechanics are altered and compensatory M/APs are used to move about, greater stress and strain is put on all of the structures of the joint, leading to premature degeneration and inflammatory conditions like osteoarthritis. So regardless of what came first, the osteoarthritis or the excessive TFL activity, it’s important to know that this association exists simply to provide greater motivation to fix the problem before a bigger problem manifests. 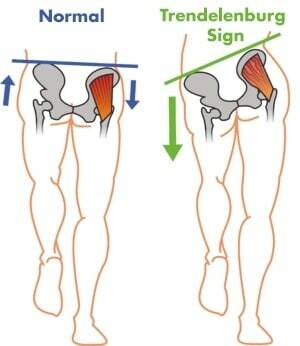 Tension and tightness in the TFL are common in those with TFL pain, as it is with any facilitated muscle. Tension typically occurs first because the brain puts the TFL on "high alert", so it has increased muscular tone and feels like it's tight or can't fully lengthen. When a muscle is working more than it should and doesn’t recover sufficiently, so it feels sore and tight just like your quads after a hard lower body workout at the gym. But because the muscle is never given the time to recover because it's always being called on to do things it's not designed for, the “use it or lose it” principle kicks in and because the muscle is never fully lengthened, it becomes tight and shortened. When either tension or tightness occur, the logical and conventional approach is to stretch the TFL, but as you now know, stretching only addresses the symptom since the root cause of TFL pain and tightness is a compensatory M/AP. So the tightness will quickly return. If you’re a runner and you’ve got a tight TFL, you may notice that on toe-off your foot rotates out and on foot strike, you’ll have a tendency to pronate. 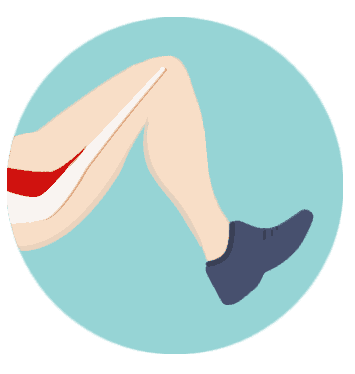 This makes your running gait less efficient and also puts you at a greater risk of shin splints. 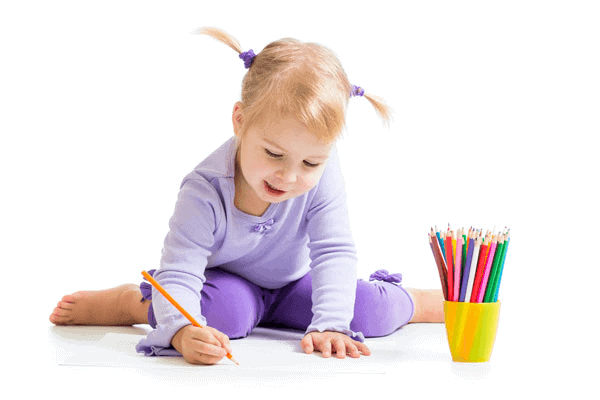 Stand 3 inches from a wall with your feet together, with your tailbone and thoracic spine on the wall. Perform a posterior pelvic tilt using the abdominal and gluteal muscles and try to flatten your lumbar spine against the wall. If you’re able to flatten your lumbar spine, your TFL is likely not tight. If you cannot flatten your lumbar spine, repeat steps 1 and 2 with your feet shoulder width apart. Visit this link for the 3 Techniques for the Best Tensor Fasciae Latae Stretch. Of course, for long-term results, you must perform these stretches in conjunction with addressing the root causes, otherwise the tightness will never subside. In addition to limiting your mobility, a tight TFL left unchecked can lay the groundwork for the following postural and functional adaptations. Because the TFL is an internal rotator of the hip, when it tightens up it can result in an internally rotated stance, which gives the appearance of knock knees. Because the TFL is a hip flexor, when TFL pain and tightness is bilateral i.e. on both sides, in standing the legs are anchored thus TFL tightness pulls the front of the pelvis where it originates down, resulting in anterior pelvic tilt. Conversely, when tightness of the TFL is unilateral, it can pull that side of the pelvis down, resulting in what looks like the pelvic dropping to one side. While your standing posture might not be affected, if the TFL becomes painful and weak from chronic overuse, during exercises like squats, step-ups and lunges, the knee might cave in. The TFL is a 2-joint muscle that contributes to 4 different movements: hip flexion, abduction and internal rotation and tibial external rotation and is a major contributor to 1-leg balance and frontal plane stability. Pain in the TFL is the result of it being overworked without sufficient recovery due to one or more of its synergistic muscles being dysfunctional and it having to pick up the slack. Treating the TFL with static stretching, massage, trigger point therapy or any soft tissue therapy will never provide lasting relief because these treatments don’t address the root cause of the pain. In addition to TFL pain, TFL tightness, knock knee posture with or without duck feet, anterior pelvic tilt, lateral pelvic drop and knees that cave in during exercises like squats and lunges are commonly associated symptoms. Enter the Precision Movement 3-Step Process to Eliminating Pain and Improving Mobility. This process is applied not just to your TFL muscle but to the entire hip complex (and quite possibly, other joints if dysfunctions or lack of mobility are present) because TFL pain is the symptom that the muscle is being overworked - not the problem. In the video below you’ll discover the 3 steps along with sample techniques and exercises that are unique to each step. 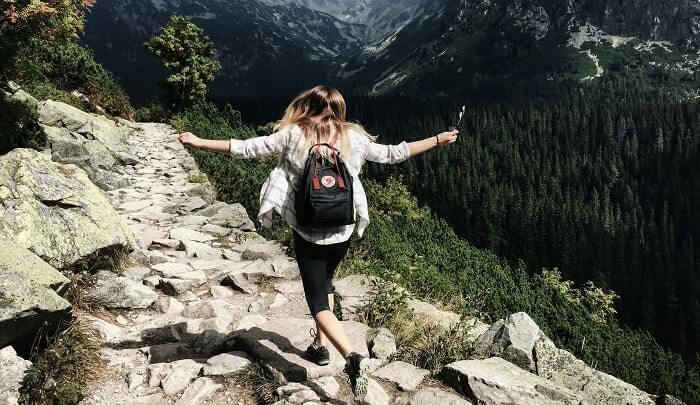 Moving and exercising with a structural limitation present is akin to driving with the emergency brakes on - every movement you make takes more energy and puts more wear and tear on the car. That’s why this is the 1st step, because without it, all of your other efforts will be for nothing. Get into a 4 point stance with a resistance band around your thigh pulling inferiorly. Internally rotate the hip then sit back and perform 5 small circles in each direction to scour the joint and mobilize the joint capsule. The TFL overworks because other muscles aren’t firing properly, so we’ve got to get them activated so they can start to pull their weight. Dissociation is the breaking of habitual, dysfunctional patterns, just like someone who continues walking with a limp even after their sprained ankle has healed. Following these 3 steps eliminates structural limitations, restores activation and strength to ALL of the muscles in the hip and creates efficient and functional movement patterns. The 5 techniques in the video and 3 techniques highlighted here are samples of the types of exercises and precision with which the exercises are prescribed to fix the root cause of tensor fasciae latae pain.